City of Cape May Municipal offices are located at 643 Washington Street, Cape May NJ 08204; phone: 609-884-9525. Cape May City, settled in the early nineteenth century, was one of the earliest New Jersey shore resorts. Unlike many other New Jersey shore resorts, Cape May City was already well established before the coming of the railroad. Today Cape May continues to be one of New Jersey's most populated resorts, marketing their 'Victorian' image to draw tourists. Cape May, located at the southernmost tip of the state, was already "a noted and much frequented watering place" in 1834. Almost 150 years before, New Haven and Long Island whalers settled in the area, beginning a tradition of maritime activity that continues today. The road built in 1796, "along which boats might be stowed," contributed to the growth of the hamlet, a village with "clean and grassy streets" by 1829. Resort and maritime trade grew simultaneously; the sloops carrying wealthy Philadelphians in 1815 passed fishing boats on their way to the island. While early Cape May County industries included lumber, oysters, clams and fish, "a considerable revenue" was "derived from the company who visit the seashore during the hot weather." Cape May's "transportation monopoly" is the best explanation for its rapid rise into a particularly attractive shore resort? A letter describing an 1823 visit to Cape May devoted three pages to the steamboat journey. Before the completion of the railroad to Atlantic City, Cape May's location—where the Atlantic Ocean and Delaware Bay meet—provided the advantage of easy sloop rides down the Delaware Bay and easy access to the shore from Philadelphia, Baltimore, and New York. An 1877 railroad brochure advertising the West Jersey line describes the "annual pilgrimage" to the cape in terms of transportation improvements. "Down through succeeding years — the stagecoach finally gave way in an unequal contest with the innovating steamboat to carry the increasing crowds of seekers after health, recreation, and enjoyment, and the boat in turn succumbed to the locomotive engine. The first visitors to arrive were accommodated in the Atlantic Hotel, summer home of Commodore Stephen Decatur. Thomas H. Hughes built the Old Congress Hall Hotel on Jackson Street a few years later. The history of Congress Hall embodies the growth of Cape May's resort trade. Once known as "Tommy's Folly," the building earned its current name in 1828 when its proprietor ran for Congress. Already one of the largest hotels in the nation, the main building was doubled in size thirty years later. The popular hotel burned to the ground during the devastating fire of 1878, which destroyed a large portion of Cape May. The next year, Philadelphia's Edward Knight built a new hotel facing the sea. Known as "the Summer home of Presidents," Congress Hall hosted Buchanan, Pierce, Grant and Harrison, who used the hotel as a summer White House. A seven-night concert conducted by John Philip Sousa on the Congress Hall lawn in 1882 also attests to the popularity of the resort. Sousa dedicated "The Congress Hall March" to the hotel owners. The 1850s marked a turning point in the urban development of the island. The town was incorporated in 1851 after an extensive street survey. Gradually, the resort gained notoriety as a place for recreation, as well as health, and the first summer cottages were constructed. Building also continued on a grand scale, as it would over the succeeding decades. Thomas Ustic Walter, architect of the U. S. Capitol, was commissioned to enlarge the Columbia House. An 1856 fire burned the Mount Vernon, then the largest hotel in the world, just two years after the Camden and Atlantic Railroad to Atlantic City ended Cape May's "transportation monopoly." Despite these setbacks, the city continued to grow in anticipation of its own railroad, the Cape May and Millville. Among the many Philadelphians banking on the trains' success, were John Bullin and Frederick Fairthorne who purchased the Columbia House in 1863. They changed the architectural future of Cape May by hiring Philadelphia architect Stephen D. Button to remodel the hotel and add a summer house. Over the next thirty years, Button designed close to forty different buildings representing a range of local architectural types and styles, from simple cottages to classy hotels. The elaborate John McCreary Villa at Columbia and Guerney, the row of seemingly mass-produced Victorian cottages built down the street in 1871-2, as well as the sprawling Windsor Hotel, constructed seven years later at Windsor and Beach Avenues, are all Button's creations. Though the Italianate villa on Washington Street is sometimes attributed to Button, it closely resembles a design Samuel Sloan published in The Model Architect. Books like Sloan's, with easily adapted patterns, were responsible for many "anonymous" Cape May Victorian homes. 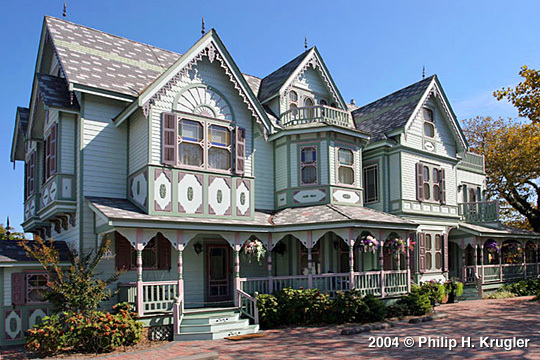 In contrast, the Emlen Physick estate attributed to well-known Philadelphia architect Frank Furness is "of a design different from any other in Cape May." The house is surrounded by various out-buildings including a carriage house, dovecote, and school. The Physick House, today occupied by the Mid-Atlantic Center for the Arts, overlooks a tennis court in a neighborhood of year-round homes, proving that Cape May is home to a population not perpetually on vacation. Though Atlantic City and other shore resorts depended on the railroad for development, Cape May was already well established when West Jersey trains began to arrive. The company's 1877 promotional booklet describes the trip from Philadelphia across the state, eventually pulling into the Cape May depot. Visitors were greeted by "drivers or attendants vociferating the names of all the hotels at the cape." Along the ocean front, those being driven to their hotels could not miss the L-shaped Congress Hall with its hot seawater bathing pool and 1,000 ft. ocean pier. The hotels capturing sea breezes and views — the Ocean House, Centre House, Atlantic, Columbia, Marine Villa and others — were probably most desirable, but also most expensive. A large number of smaller hotels and boarding houses were hidden away in "the shady city" just a short walk from the beach." Washington Street was the primary shopping district, running from the Congress to Schellinger's landing on Cape Island Creek, parallel to the ocean. As early as 1877 it included the post office and churches, as well as many stores. Today, the Washington Mall is a pedestrian promenade offering a variety of shops catering to tourists. Some of the older buildings have been preserved, like the 1895 Branch of New Jersey Trust and Safe Deposit Company, a yellow brick building with a central clock above the entrance at the Ocean Avenue end of the mall, and the Central Pharmacy, dispensing "pills and potions" on Washington Street since 1872. The 1877 guide considered both Washington Street and Lafayette, the street paralleling Washington a block to the north, "the principal interior avenues of the city. Throughout Cape May's history, the beach and sea have remained constants, drawing visitors from all over the world to "the watering place. Writing about her trip to America, Swedish novelist Frederika Bremer described the social scene at Cape May in 1850. It is now about 10 o'clock in the morning; a very parti-colored scene presents itself on the shore at an early hour; many hundreds, in fact more than a thousand people, men, women, and children, in red, blue, and yellow dresses; dresses of all colors and shapes — but the blouse-shape being the basis of every costume, however varied — pantaloons and yellow straw hats with broad brims, and adorned with bright red ribbon, go out into the sea in crowds, and leap up and down in the heaving waves, or let them dash over their heads, amid great laughter and merriment." Though sea bathing is aesthetically different today, part of its history is extant in the rows of cabanas that line the beach. The wood framed "tents" with blue plastic covers have offered shade to families since the late 1800s. Today, the cabanas are rented out seasonally, weekly, and daily and include large wood storage boxes. The cabana service has been in the Steger family since the 1930s. The building across the street dates to ca. 1900, when it functioned as a beach house. Double gate entrances on either end are still visible under the advertising for Steger's "Sun and Surf Shop, Beach Fashions." The tradition of the boardwalk dates back to 1869 and is possibly he oldest along the Jersey shore. The sea wall is also historic, protecting half a mile of the beach front since before 1877. In 1905-8 work progressed on an impressive addition to the coastal landscape, the Hotel Cape May. Originally a Georgian-style hotel designed by Philadelphia architect Frederick Osterling, the building was remodeled along French baroque lines before its completion. The hotel still overpowers its frame neighbors under its new name, the Christian Admiral. Travel guides documenting the rise and fall of Cape May's popularity emphasize competition with other shore resorts. In the 1930s, the WPA guide assured potential visitors that "the city does not fret over its loss of patronage." As a contemporary travel writer observed, Cape May was upstaged by Atlantic City in the 1920s and Wildwood in the 1950s. After the 1962 hurricane, the city began a preservation effort leading to extensive restoration of its architecture and the enforcement of strict building codes. Along with this attention toward the built environment came a number of exotic restaurants, which also contributed to the resort's new image." Today, Cape May offers a combination of Victorian culture, packaged in scenic tours and standard boardwalk fare from skeetball to pork rolls. Classier gift shops selling ethnic artifacts, animal sculptures and Cape May — emblazoned apparel are also plentiful in the mall areas, and antique stores can be discovered tucked away in unlikely corners. Alexander, Robert Crozer. Ho! For Cave Island!. Cape May: By the Author, 1956. "Congress Hall: 1991 rates and Information." Cape May: 1991. Fodor's. Vacations on the Jersey Shore. New York: Fodor's Travel Publications, Inc., 1991. Gordon, Thomas F. Gazetteer of the State of New Jersey. Trenton: Daniel Fenton, 1834; reprint, Polyanthos, 1973. Heston, Alfred M. South Jersey: A History. 1664-1924. New York: Lewis Historical Publishing Co., Inc., 1924. "Historic Reproduction of Cape May." Cape May, NJ: Robert W. Elwell, 1988; reprint West Jersey Railroad Company, 1877. Studley, Miriam V. Historic New Jersey Through Visitors Eyes, vol. 18, The New Jersey Historical Series, Princeton: D. Van Nostrand Co., 1964. Sebold, Kimberly, and Amy Leach, Historic Themes and Resources within the New Jersey Coastal Heritage Trail: Southern New Jersey and the Delaware Bay. Washington D.C.: U.S. Department of Interior, 1991. Thomas, George E.and Doebley, Carl. Cape May: Queen of the Seaside Resorts. London: Associated University Presses, 1976.